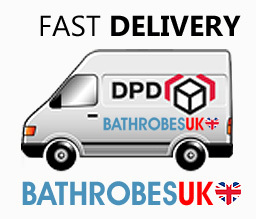 We offer a fast next day deliver to all UK mainland addresses provided the order is placed and paid for before 3pm. For EU customers delivery from UK takes 2 working days depending on which zone you are in. We use DPD for all our delivery - they are all signed for with online tracking to give you uptodate info on your order at any given time. Our SMS notification service means you will know where the item is at any given time. ZONE C: Czech Republic, Italy, Slovakia, Spain: £16 for one box. When will my delivery would arrive? How long does custom bathrobes take to make?